FreeRTOS has many memory allocation options (see Memory Management) with four ‘schemes’. One of it is the a simple wrapper over the library malloc() and free() routines. I admit, I have not used them, as usually I avoid to include such kind of libraries, as they have their own problems. Anyway, a discussion in the FreeRTOS forum raised my interest: obviously some malloc() implementation (as in the EWL library of CodeWarrior) are making a safety check against the current stack pointer. The solution to this is to get rid of that check. But how to do this? Recompiling the library is really painful. But there is an easier way (as I discussed in “Link Order: Using Multiple Definitions with ARM GNU Linker and Eclipse“): to write my version of sbrk() and have it overwrite the one in the library. 💡 For GNU ARM Embedded (launchpad) tools (as used in Kinetis Design Studio v3.0.0), the name of the function needs to be _sbrk (with an underscore in front). Luckily, there are no dependencies :-). Library malloc() implementation might conflict with the way the heap is used with an operating system like FreeRTOS. Instead to recompile the library, an easier option is to give a custom overwrite of a function to fix the problem. This entry was posted in Building, Embedded, FreeRTOS, gcc, Tips & Tricks and tagged arm gcc, Building, CodeWarrior, FreeRTOS, software, software project, Tips&Tricks, tool chains by Erich Styger. Bookmark the permalink. c:/freescale/kds_1.1.1/toolchain/bin/../lib/gcc/arm-none-eabi/4.8.0/../../../../arm-none-eabi/bin/ld.exe: warning: -z multidefs ignored. Also, do you think KDS has a link order feature like CodeWarrior? Is the malloc() reentrant? If I use C++ new operator or other C++ functions or call malloc directly, and they are run in the same time, will this cause chaos? What can I do to ensure the thread safety? That depends on the implementation of malloc() if it is reentrant or not. But typical implementations are *not* reentrant. 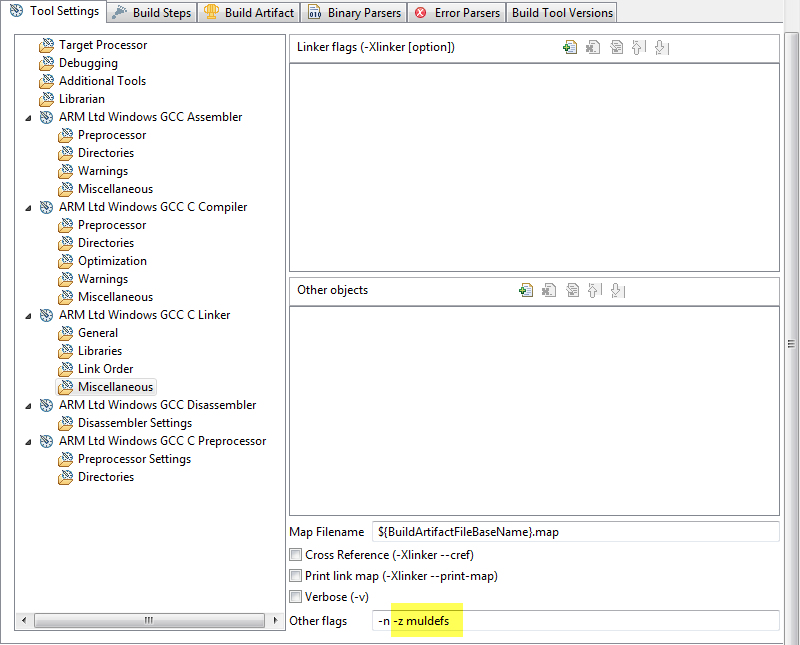 That’s why FreeRTOS provides a wrapper to it which is thread safe (see http://www.freertos.org/a00111.html). If your malloc is not thread safe, the usual way is to use a thread safe wrapper as FreeRTOS provides it. But what about the C++ objects? I can’t make them use FreeRTOS ones. You could overwrite the library malloc() and free() with your own version. Thanks for sharing, really useful post as we also were facing this issue. Second, avoiding the usage of explicit usage malloc() doesn’t avoid the implicit usage: newlib makes the non-thread safe stdlib APIs (like srand(), rand(), strtok()…) reentrant by adding a wrapper around it. This wrapper makes use of malloc(). So calling one of these APIs calls malloc implicitly. indeed, good points, thanks for sharing! That’s another reason to avoid these standard ANSI library API calls, and most embedded applications completely avoid usage of the ANSI library because of this. The ‘hack’ for this would be to wrap such calls to srand() etc from the tasks from where they get called. I have no heap fail msg now?! It would be great to have a malloc that could report mem allocation errors. malloc() will return NULL if it failed (was not able to allocate memory). Thanks for the hint about the function name depending on the specs file, I was always wondering about this. Thanks for your sharing, It really solved my critical issue. And if some guys has this issue, i think you can define a data region behind heap, and then static allocate stack from this region, call xTaskCreateStack() to pass a static stack to a task. so the stack is always located after heap, then malloc() go through.